If you can imagine a custom intake system, now you can build it! The U-Build-It (UBI) kit is the most versatile custom intake system on the market. Our master kits include everything you need to build a complete system, and all components are also available individually for maximum adaptability. Whether you are doing an engine swap or have a custom application where space is tight, the AIRAID® UBI Intake System can accommodate just about any application. The only limitation is your imagination! Each UBI master kit and individual intake tubes are available in 3”, 3.5”, 4”, 5”, and 6” diameters. 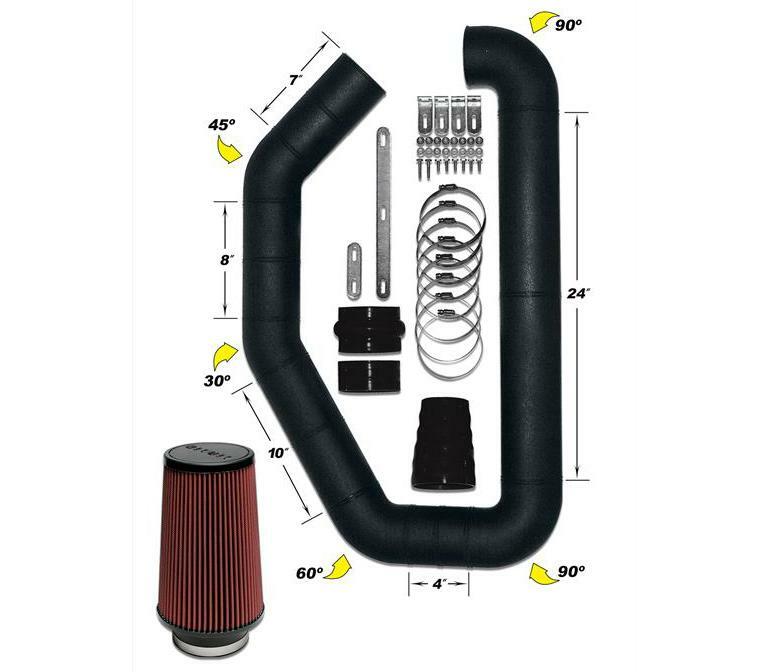 The roto-molded intake tubes feature multiple angles and straights that allow you to route the intake to any desired location in the engine compartment. The master kits include an intake tube, coupler, hump hose, reducer, brackets, hose clamps, hardware, and a premium AIRAID® filter. While a UBI master kit is recommended for anyone building a custom intake system from scratch, sometimes completing a custom intake might require a few extra couplers, or perhaps an extra bend. To address this, AIRAID® offers all of the UBI components individually. All of the UBI intake tube straights and bends are available as individual pieces, as well as couplers, hump hoses, clamps, filter adapters, and so on. AIRAID® also has a wide selection of filters in different sizes that are compatible with all of the UBI systems. In addition to individual components, AIRAID® offers several specialty components. Two different carburetor hats are compatible with many EFI throttle bodies and most popular performance carburetors. AIRAID® also has a growing line of application- specific Cold Air Dam Systems, including kits that fit GM A-body and F-body cars.